The words were carefully chosen by Xiaomi's Hugo Barra, which means the Chinese company hasn't yet decided when exactly it will bring its products in the United States. The good news is Xiaomi fans in the US will soon be able to purchase the company's products, but the bad news is there won't be any smartphones to buy. TechCrunch reports that sources familiar with Xiaomi's plans confirmed the company will start selling its first product, an Android set-top box, in October. 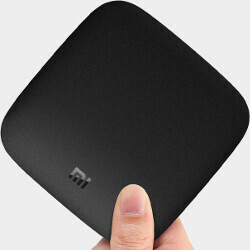 The so-called Mi Box will be Xiaomi's first product sold in the US, if these rumors prove to be accurate. Xiaomi hasn't yet confirmed the price of the Mi Box, but rumor has it the Android set-top box will cost less than $100, at least in the US. The launch of the Mi Box in the US is a test that will allow Xiaomi to assess this market before going all in with its portfolio of smartphones. For those out of the loop, the Mi Box is a set-top box that can stream 4K video at 60fps and features support for Dolby Digital Plus audio playback. It runs Android OS and packs a quad-core ARM CPU, complemented by a Mali 450 graphics processing unit, 2GB RAM and 8GB of internal memory. Xiaomi also added a controller in the sales package, so those who are into gaming can play Android games on their TVs. They cant sell smartphone because they'll face patent lawsuit from big companies like apple. Not if they stop copying the designs. Ever think of that? They make iPhone clones for Asia because that works over there. I imagine they have the ability to make something with a different Industrial Design for the USA. Oh dude..have faith in humanity. All this time you still believe people buy phones because it looks like iphone? Oh come on! What dynasty are you from? I might get the Mi-Box, though lord knows I don't need any more streamers. I'm hoping that it will allow amazon prime video on it, unlike the nexus player. and yes, Xiaomi is able to design some damn nice phones these days, that are not a clone of anything.